i entered the living room a short while ago, only to find a scene that set off all the alarm bells. my favorite animator was stretched out on the chesterfield with my little brown blanket pulled up over his head. there beside him were the two cats. everybody was fast asleep. on the other side of the wall of glass, just beyond this blissful slice of domesticity, two squirrels were investigating the balcony filled with plants... my plants... my very-recently planted plants. everybody was in trouble! then returned with a couple more things from the cupboard under the sink, and i was ready to whip up a batch of my favorite pest-be-gone spray. i use the same approach when fighting common garden bugs, but the object of this current exercise is to discourage pests of the furry kind. think of it as a do-it-yourself preemptive chemical warfare... with common household ingredients. the key to this approach is twofold: 1) use oil-based natural irritants, and 2) suspend them in water through the magic of soap. 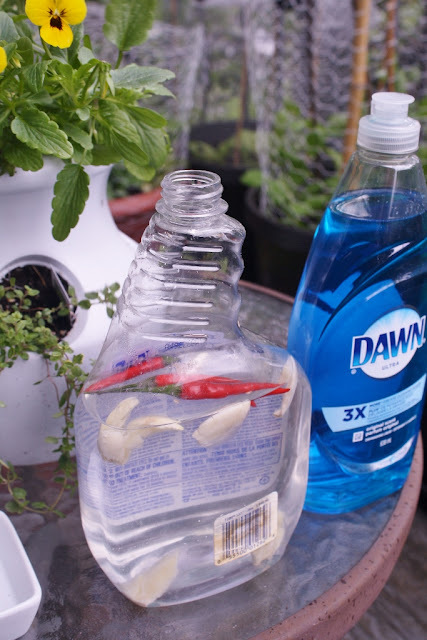 my go-to irritants are garlic and hot peppers (peppermint is also a good choice, but i have none on hand), and i use regular dish soap for the 'magic'. i am reusing a spray bottle (this one contained some sort of tub/shower cleaning product, if you really need all the details) which i rinsed thoroughly and filled most of the way with tap water. note that the garlic cloves have been smashed (which the culinary world reminds us is the best way to release the natural oils in garlic), and i used a sharp knife to cut a long slit through the middle of each pepper to allow for better contact between the liquid medium and the oil-bearing innards of the pepper. basically, i try to avoid small bits that will clog the sprayer. 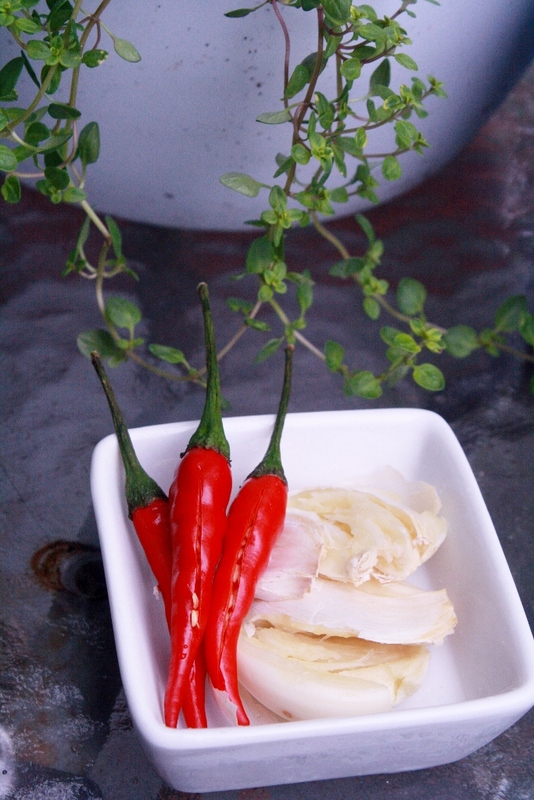 chili oil or even a prepared hot sauce (the hotter, the better) can be used in place of the fresh chilies, but i like the touch of old-school alchemy that comes with starting from scratch. 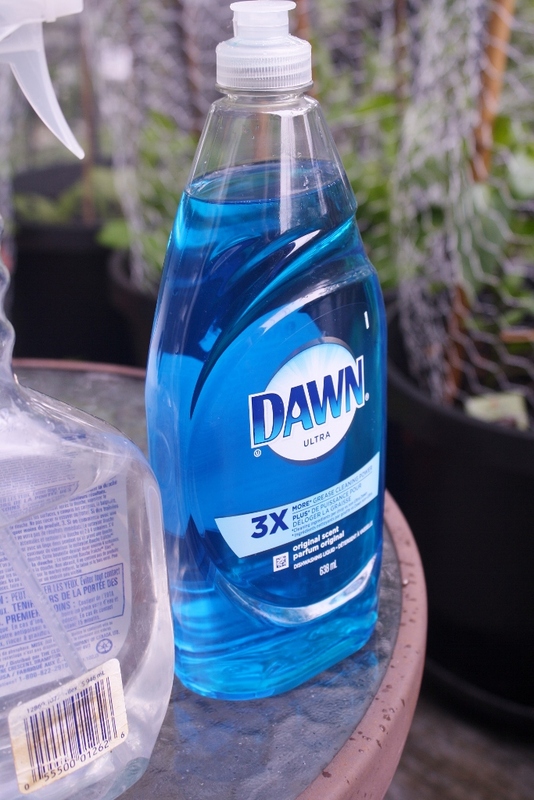 then add in a generous squirt of dish detergent (i did not measure, but i used about a teaspoon or so of soap for a standard-size spray bottle). seal the bottle tightly before inverting a few times to distribute the soap... then just wait. i offer one word of extreme caution when using a spray that contains hot peppers... remember that it contains hot peppers!!! it becomes dangerously potent the longer it sits. 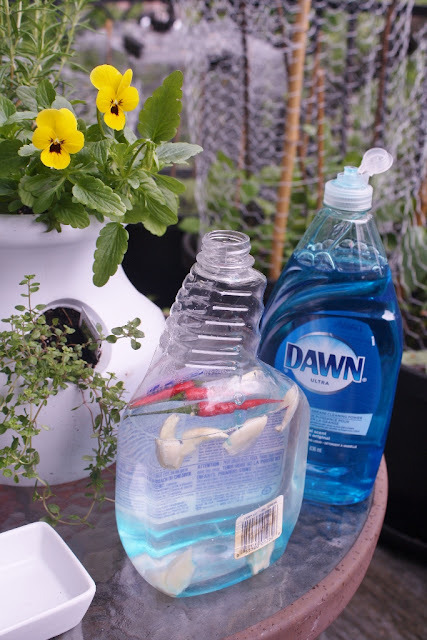 i do not use this stuff when it is windy outside, and i always take the precaution of spraying it away from my person, and keeping the cats indoors until it has had a chance to dry on the leaves of the plants. 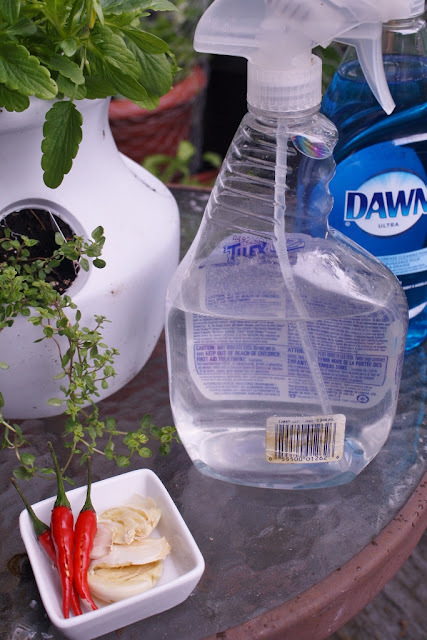 in addition to facilitating the mixture of the oils with the water, the soap will help to create a slightly sticky film that bonds them to the surface of the plants, but it washes away with water. this means that i have to do a respray whenever it rains (or if i use some sort of sprayer to water the plants). 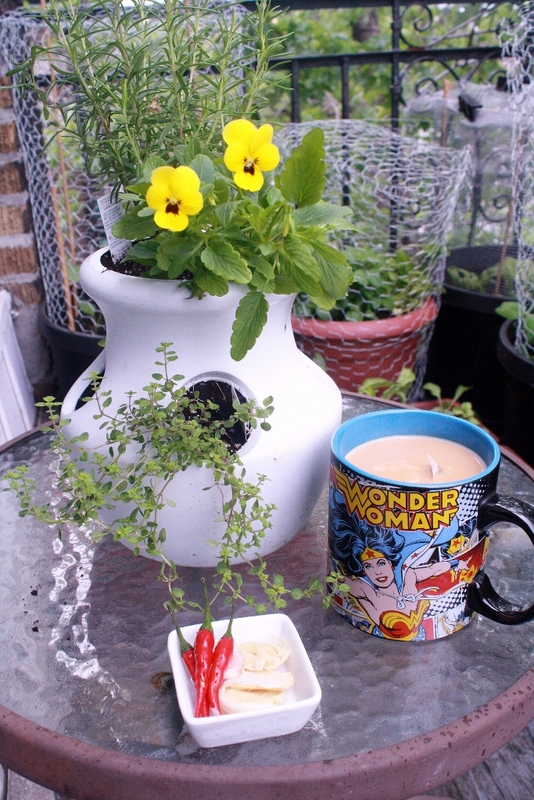 i also make a point of washing my hands thoroughly (with extra soap) after handling the plants, because there are few things in life as unpleasant as the combo of garlic, soap, and chili in the eye. ask me how i know! 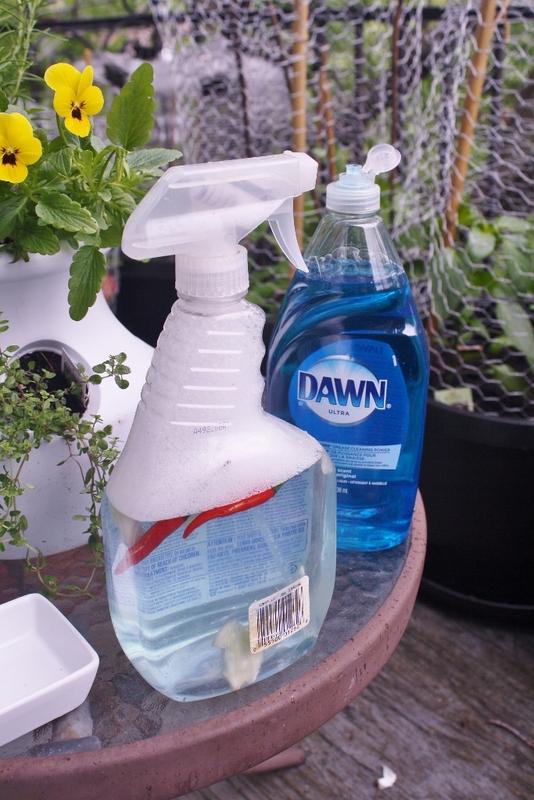 i do not use this spray indoors, for obvious reasons, but it is a simple, effective method for discouraging bugs (and the larger pests) away from the outdoor plants. sprayed on already-buggy plants, it acts as an irritant that can penetrate past the protective outer covering of some bugs and their eggs. i would put on a lab coat and launch into a discourse on polarity in soap molecules and their ability to denature cellular membranes... but no one needs to be exposed to such a thing. just trust me when i say that it works! as for the squirrels... a few nibbles of peppery leaves tends to discourage them from turning your garden into an all-you-can destroy salad bar. not gonna lie, i find a special (twisted) joy in that part. it is Sunday morning, and i am sitting here enjoying my first cup of coffee and scowling over the latest news, when i am distracted by a sudden burst of activity outside. the rustling in the maple canopy tells me that there is a squirrel headed this way. the pet-deterrent formula has been sitting for just one day. is it too soon to put it to the test? 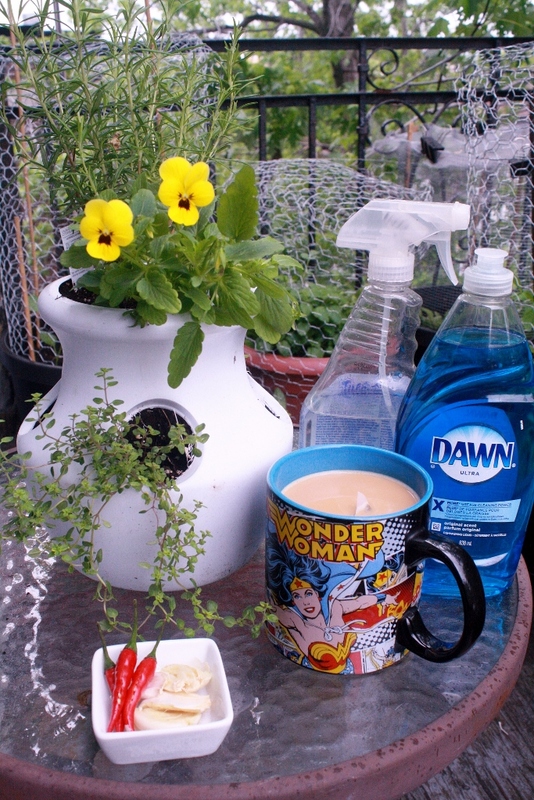 i put down my cup and move quickly toward the door, grabbing the spray bottle along the way. i give it a few vigorous shakes and a quick pull at the trigger to make sure it works, then i go to work spraying the three troughs of greenery (the only things that were not encased in their own metal cages). satisfied at the light mist that has settled across the leaves, i return to my coffee and my comfy sofa... and i wait. it takes about ten minutes before there is a springboard-like action in the nearest cluster of leaves, and a squirrel pops into view atop the railing. this is the point where i usually make my presence known to deter any further advancement into my domain. instead, i take a sip of lukewarm coffee and continue to wait. (s)he moves cautiously at first, climbing onto the nearest metal cage and continuing along the line of impregnable steel (they work!) before spotting the troughs of green on the ground. this is the real test. i sit perfectly still, lest i startle the intruder by shifting my position to get a better view. it takes less than a minute before a quick blur of grey fur goes rushing off in the direction from which it came and launches back into the canopy of the maple tree. think i will celebrate with a second cup of coffee.